Netflix announced that they have ordered 6 more episodes of the Joel McHale Show With Joel McHale. 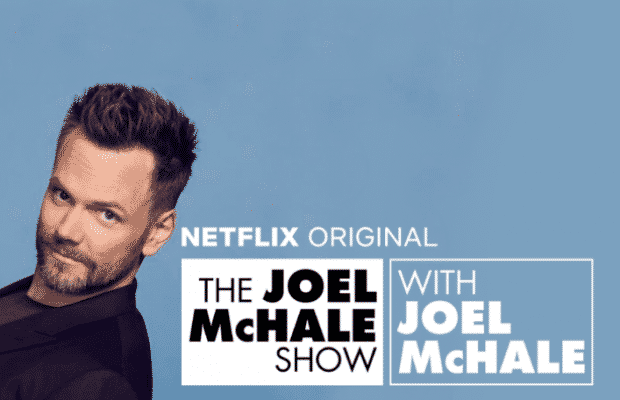 Today Netflix announced the pick-up of six additional bonus episodes of The Joel McHale Show with Joel McHale. All six episodes will debut July 15, adding to the first season’s roster of celebrity guests, comedy sketches and insane video clips from the worldwide realms of TV, sports, politics, celebrity culture, and every corner of the internet. Host Joel McHale took to the green screen to share the news with fans in the episode debuting this Sunday, May 13 featuring guest Seth Rogen. The Joel McHale Show with Joel McHale is a half-hour topical talk show that takes a sharp, absurdist look at pop culture and news from across the globe. It’s a fast and funny distillation of everything people are talking about – alongside the bizarre, ridiculous stuff Joel digs up that everyone will be talking about. Season one’s celebrity in-studio and sketch guests include Kevin Hart, Kristen Bell, Drew Barrymore, Timothy Olyphant, Alison Brie, Seth Rogen, Gabriel Iglesias, Bellamy Young, Susan Kelechi Watson, Anna Faris, Eugenio Derbez, Billy Eichner, and Paul Reiser. McHale also serves as an Executive Producer, along with Paul Feig, KP Anderson, Jessie Henderson, Brad Stevens, and Boyd Vico. The Joel McHale Show with Joel McHale is filmed on location at Sunset Bronson Studios in Los Angeles, the show is produced by Pygmy Wolf Productions, Free Period Productions, and Feigco Entertainment in association with Lionsgate Television.